I’m pretty sure all of us have been there at one point or another. 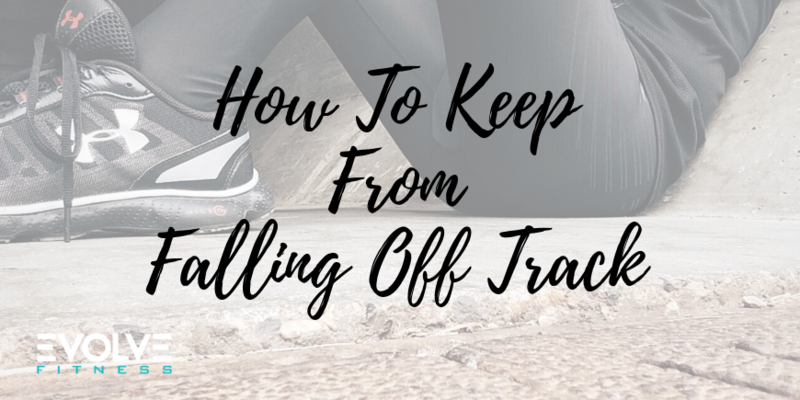 Falling off track can really put us down and bring some crappy feelings. There are quite a few things that could be causing you to get off of your plan, let’s talk about the two most common reasons. When you do this you are setting yourself up for failure and not success. You may have heard that it’s better to “never quit” or “no excuses” but in reality, doing too much may actually be hindering your progress. It almost always is a sure fire way to end up being overwhelmed. Allowing yourself time to adjust to doing something new and starting slowly to build yourself up is a much more sustainable approach. Set small, attainable goals and build upon them once you have a strong foundation. Accomplishing a small task (for example, cutting out soda, starting to eat more whole food, going to the gym 2-3 times a week, etc.) is much better than doing nothing at all because you quit after putting too much on your plate and becoming overwhelmed. When setting small attainable goals, make sure to write them down AND tell someone! These two actions make them more real. Having a planner or journal to utilize is a great tool! Did you get to the gym 2-3x per week, but still haven’t stopped drinking soda? Also, don’t be too hard on yourself when first starting. Changing habits is HARD. Recognize both the accomplishments and the failures and then work to be better. Take those “failures” not as that, but as a learning experience. The people you’re surrounding yourself with are hurting you, instead of helping you. We have all heard the saying, “you are the combination of the 5 people you surround yourself with”. Take a look at the people you’re around on a daily basis. Are they supportive and encouraging? Do they have similar goals? Pick you up when you’re down? Having a good support system is huge when it comes to accomplishing anything. It helps being around people who are dealing with similar things or have dealt with them before – having someone to connect with. How to hold yourself accountable: Make sure you have a least a few people in your corner rooting for you. Reach out on social media and engage with people you think you would click well with! Talk with one of the Evolve Personal Trainers or friend a member at the gym. Try our one of our free classes and meet new people. Maybe you will find a new workout buddy! There are a ton of different options when it comes to surrounding yourself with positive and uplifting people, you just have to put yourself out there and try!